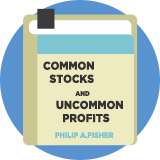 Philip Fisher Growth is a growth investing strategy inspired by the approach of legendary US investor Philip Fisher, who wrote Common Stocks and Uncommon Profits. The strategy is based on his 15 point checklist for finding growth stocks. It looks for a track record of strong sales growth, above average net margins and a low price-to-earnings growth rate over five years. Philip Fisher wrote: "If the right stocks are bought and held long enough they will always produce some profit. Usually they produce a handsome profit." His most famous investment was stock in Motorola, which he acquired in 1955 and held until his death, during which time the shares grew 20-fold. Philip Fisher's investment management firm is now headed by his son, the highly regarded value investor, Ken Fisher, whose stock picking strategy is also tracked by Stockopedia.